Thumbstopping Content - What is it and Why Do You Need it? A few years ago I was travelling somewhere by train. I can’t remember where. Or exactly when. But the one thing about that anonymous rail journey I do remember was a young guy. He was sitting on the other side of the train from me. I was on the aisle on the right of the carriage. He was on the aisle to the left of me, a few rows of seats ahead. Like millions of travellers, he was using his smart phone. And while I couldn’t see what he was browsing, it was clear by the action of his thumbs he was on a social network. The thumb of his right hand was making that familiar upwards swiping motion. And as the train rumbled towards its destination, with the sunlight strobing into the carriage I noticed that, from time to time, his thumb would stop. It would stop, and there would be a very slight downwards swipe. Then a pause. Then the upward swipes would begin again. I couldn’t see what was causing his thumb to stop. But it was clear he was doing what billions of us do each day. We swipe through the content on our Facebook feed. Our Instagram feed. Our Twitter timeline. And, occasionally, a piece of content amongst the digital noise causes our thumbs to stop. Why should this matter to businesses? If we’re using social networks to market our brand, products, message, services, we want the thumb of our target market to stop on our content. Of course we do. Why else are we posting to these social networks? It’s not just a box ticking exercise, is it? You see, stopping the thumbs of the people who we dearly wish would react to our content is the first step in the process of getting a reaction. It’s one of the most important reactions, too. That motion of the thumb stopping. The slight downwards swipe of the thumb that centres our content on their screen. I’ve written about the differences between the two here. Which Content Will Stop Thumbs? 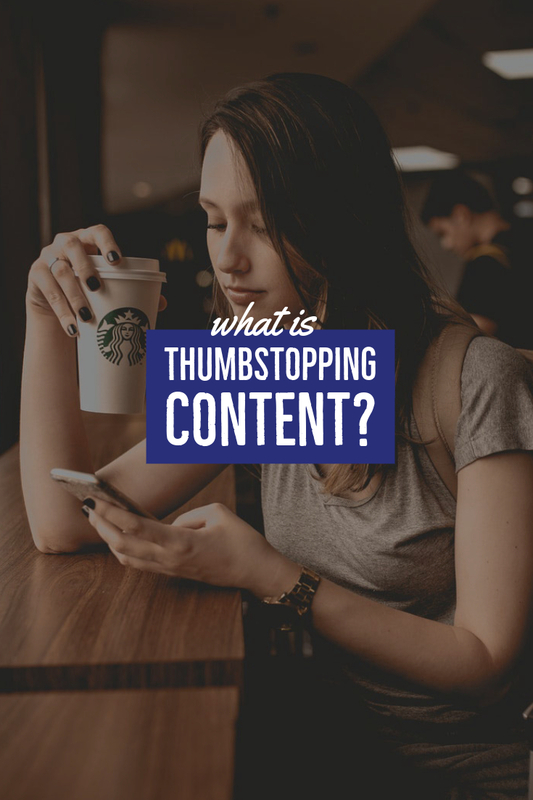 With the typical social network user being shown thousands of pieces of content per day, it’s critical to understand which content will stop the thumbs of our target market. I’m going to be releasing a downloadable masterclass on how to identify and then create the sort of content designed to be thumbstopping. The masterclass will be in video format where I’ll explain some of the science behind the content that stops thumbs. I’ll show you how to train yourself to identify thumbstopping content. How to analyse why it makes thumbs stop. And how to get both vanity and actionable reactions from it. I’ll take you through the apps to have on your phone or tablet and how to use them, wherever you are, to create an ever-ready library of thumbstopping content to use on Facebook, Twitter and Instagram. The sort of content to have in your blog posts and YouTube thumbnails. To register your interest in this masterclass, fill out the form below, and I’ll keep you posted on how you can access it. It won’t be made available anywhere else. I’m really excited to be bringing you this exclusive content, and I can’t wait to share it with you. And you can download a FREE video where I discuss the concept of thumbstopping content here. I'd like to be kept up to date on Thumbstopping Content! Please let me know when it's available. The occassional email is fine. Older PostWhat's the Best Tool for Instagram Scheduling?